Alumnus and volunteer assistant coach Bill Dickson talks with redshirt senior infielder Sara Bradley on the bench. Bill Dickson ’54, M.S.E. 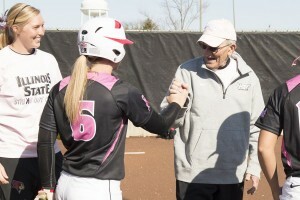 ’57, means a lot to the Redbird softball team. He’s their volunteer assistant coach. Corner infielding expert. Scorekeeper on the bench. Rules interpreter. Candy supplier. Pregame dance partner. 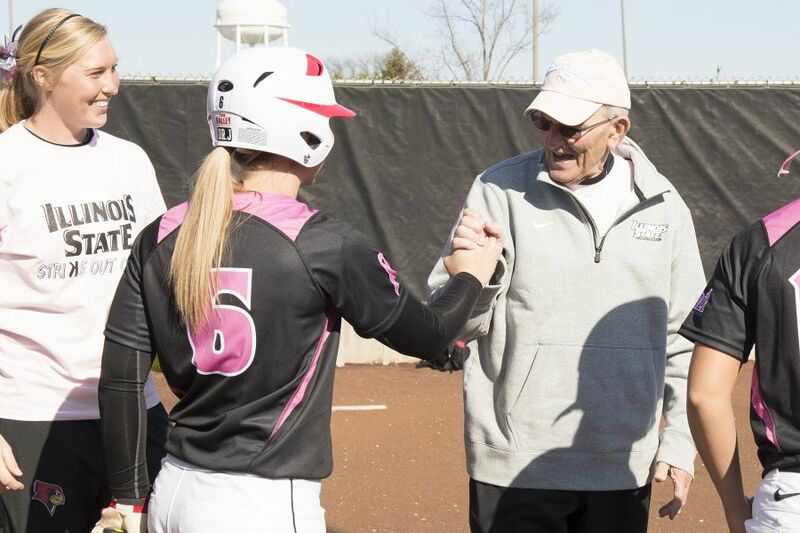 “He’s our grandfather, is really what it is,” says redshirt senior infielder Sara Bradley. “If you don’t have a family member in the crowd, you can always find support from him on the bench. He’s not afraid to tell you what he’s thinking, but he’s always supportive, every single time. But it’s become much more than that. Through practices, road trips, and fun moments during pregame warm-ups, Dickson has connected with his “girls” in a way that goes beyond player-coach. And his volunteer coaching has kept Dickson close to the game he loves—softball. Dickson is now in his 16th season with the Redbirds. The Amateur Softball Association of America Hall of Famer certainly has the knowledge to teach technique to first and third basemen, said Redbirds head coach Melinda Fischer ’72, M.S. ’75. Dickson’s recent corner infield pupils include Amber Smith, Kara Nelson, Abby Olson, and Laura Canopy, all of whom have earned All-American or All-Region accolades since 2006. “But his real area of expertise is life lessons,” Fischer said. “He brings to our program a wealth of knowledge and experiences. You just can’t replace what he has and what he’s experienced with anything. “That’s just so valuable for these young girls to hear,” she added. The U.S. Army veteran grew up in tiny Lovington, Illinois. Dickson was a standout player on some big men’s fast-pitch softball teams, which were popular in the U.S. (especially in Illinois) in the 1950s and 1960s. 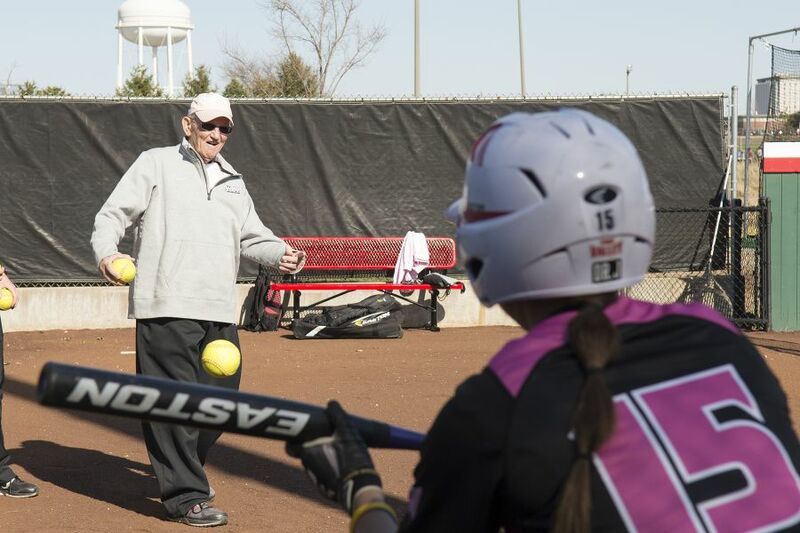 He played softball in 21 different states (plus Canada and Mexico) and was a two-time Amateur Softball Association (ASA) national tournament champion, with eight total Top 5 finishes. His playing days ended in 1966, and after graduating from Illinois State, he taught for eight years and then served as a superintendent in districts around the state for three decades. Dickson works with Stephanie Gallant during pregame warm-ups on Wednesday, April 9, 2014. Dickson retired in 1997, moved back to Normal with his wife, Sonia, and began to volunteer with the team. Up until some recent health problems, he was still hitting balls to the team during pregame warm-ups. He still works with the “corners” and helps out in other ways, including scorekeeping. Dickson says he likes getting to know his players and their parents. And as a former educator, he can even talk to the future teachers on the team about their soon-to-be careers. He means that literally. After a recent foul ball scare, a player now stands near him on the bench with a glove, just in case. And on road trips, if he needs to use a wheelchair to get through an airport, he’s got plenty of help. “It says a lot about him that he’s still here volunteering,” Bradley said. Sixteen seasons in, Dickson still enjoys being part of the team. “Somebody’s got to help chaperon these 18-year-old ladies. Might as well be me,” Dickson joked. Check out Dickson, Bradley, and the Redbird softball team in action this season.